ANTAKYA (Turkey) (Sputnik) - Death toll from an explosion at an arms depot in the town of Sarmada in Syria's northwestern province of Idlib increased to 50 on Sunday, a source in the Syrian opposition told Sputnik. Earlier in the day, the source told Sputnik that the blast claimed lives of 36, while 40 people were injured. "Death toll from the blast at the arms depot in Sarmada increased to 50 people, over 40 people injured were delivered to various hospitals," the source said. The arms depot was located in the basement of an apartment building, the explosion resulted in the building’s destruction and many victims. The depot presumably belonged to an arms dealer, the cause of the blast is yet to be determined, according to the source. 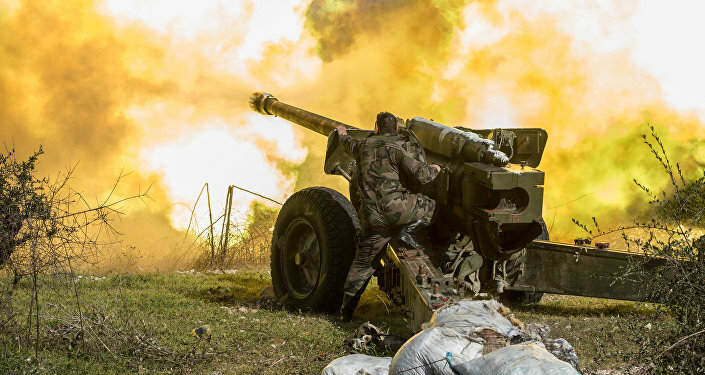 Late last month, Syrian President Bashar Assad pointed out that the liberation of Idlib, which sits on the border with Turkey, was among the priorities for the Syrian military's operations. Since 2017, the Idlib province has been included in the northern de-escalation zone created under the Astana reconciliation process. Most of the province is currently occupied by a disparate collection of militant groups, including al-Nusra Front. * With the liberation of broad areas of southern Syria earlier this month, Idlib has become one of the last anti-government strongholds in Syria. *al-Nusra Front, a terrorist group banned in numerous countries, including Russia.